Motorex KTM’s Todd Waters has claimed pole position for today’s final round of the Monster Energy MX Nationals, winning this morning’s GoPro Super Pole session after topping regular qualifying yesterday. Waters posted a 1m40.4 to top the time sheets, despite a mistake mid-lap and he ended up half a second faster than MX1 series leader Matt Moss (Motul Pirelli Suzuki). The top five was completed by Billy Mackenzie (CDR Yamaha), Kirk Gibbs (Motorex KTM) and Cody Cooper (Motul Pirelli Suzuki). New MX2 champion Luke Styke (Serco Yamaha) topped MX2 qualifying, but he decided to sit out the MX1 on Sunday after qualifying 10th. Styke led KTM duo Brock Winston (Choice Motorsports KTM) and Kale Makeham (Tune Tech Racing KTM), with Beau Ralston (Yamaha) and Dylan Long completing the top five. GYTR Yamaha’s Jay Wilson was fastest in the MXD ranks, from Caleb Ward, champion-elect Hamish Harwood, Jesse Dobson and Jake Emanuelli. 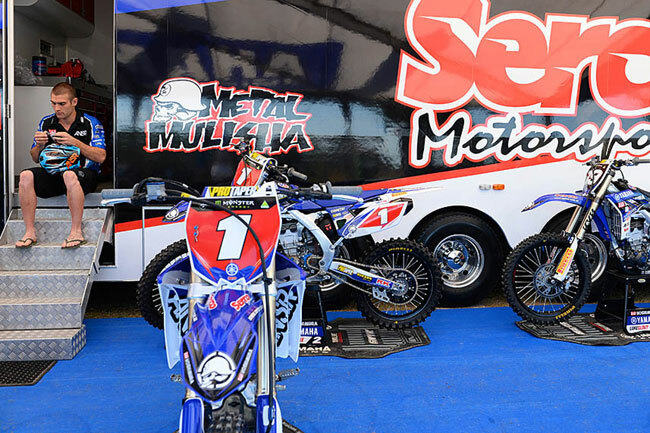 Serco Yamaha’s Luke Styke was fastest in MX2 on Saturday.